This IT governance matrix model and these recommendations provide a starting point for academic library administrators to begin to address the IT needs in their local environment. The 21st-century academic library depends on reliably functioning, responsive, innovative, and robust IT services. Although Campus IT supports departments across the entire institution (such as accounting, human resources, purchasing, and staff and faculty computing), the unique configuration of a university library often reveals it to be more like an “institution within an institution,” with many of the same needs. Furthermore, the academic library has unique needs (including managing acquisitions, managing and securing the use of its inventory, creating end-user discovery interfaces, and negotiating and managing numerous vendor contracts). The amalgamation of all these services places distinct IT needs on the university library. University libraries have been leaders in employing IT to improve services. 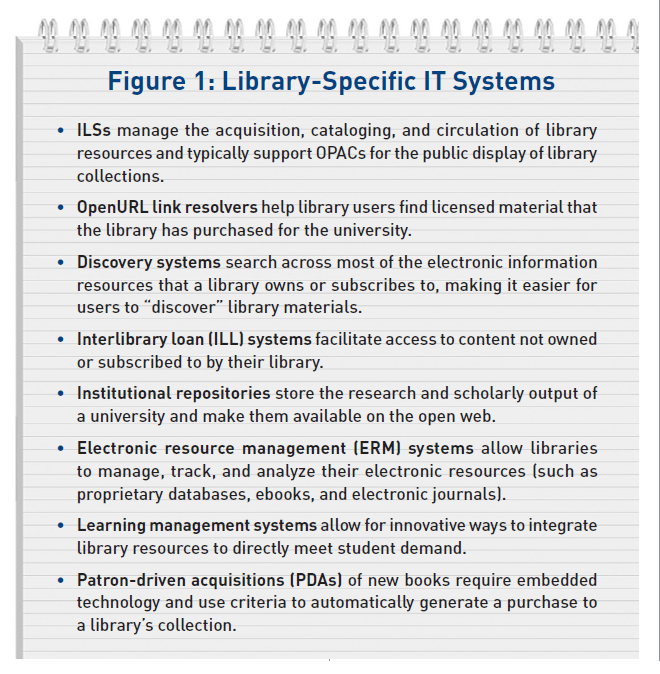 The current environment for academic libraries requires staff members to possess IT skills, but also requires Library IT experts who understand the intricacies of library systems and how they work with the Campus IT framework. To maintain the university library’s high standards of customer service, these Library IT experts also must understand the mission, values, purpose, and evolving nature of the modern academic library. Most Library IT services are closely tied to the effective delivery of print and proprietary digital collections. Many of these library-specific tools (see Figure 1, right) are not well-understood outside of libraries. 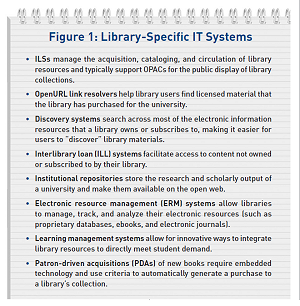 In addition to the unique systems used to provide library services, academic libraries’ IT staff must support the learning and computing needs of students and faculty members on a daily basis. Although many professional librarians are adept at IT, the integration of skilled Library IT staff members speeds innovation, prototyping, and execution of new services. Effectively managing the IT infrastructure required by the modern academic library is challenging. Most library managers do not have an IT background, and even those who do may have trouble keeping up-to-date with rapidly changing technology after they assume administrative responsibilities. Investments in IT equipment and staff are expensive, and it is difficult to determine if the money has been well-spent. How does a manager know if the highly paid systems admin in the data center is fully and effectively occupied? Or if the “significant improvements” that the ILS vendor has made to the back end of its database justify an expensive software upgrade? Or if a big initial investment in a virtual desktop system will save money in the long run? Because of the challenges, it is tempting for managers to ask how much of the burden of managing IT functions, on a day-to-day basis, can be outsourced to others. That way, administrators can focus on the academic mission of the library rather than on the mechanical infrastructure of machines, networks, and cables. In the academic environment, university IT departments—which have grown in sophistication and complexity during the last 30 years—seem to be a natural partner for administrators looking to outsource their IT management burdens. But how much control and autonomy can administrators give to their Campus IT colleagues before they also give away the library’s ability to innovate and adapt quickly to a changing environment? When does outsourcing responsibility for the machinery hinder the administrator’s ability to advance the academic mission of the library? This article tries to help administrators answer these difficult questions by developing a strategic approach to Library IT management based on business literature for IT governance. In the library literature, much has been written about IT trends and emerging technologies, but little has been written about effectively managing the relationship between the library and Campus IT. Is Library IT a ‘Utility’ or a ‘Core’ Service? In business management literature, there’s an ongoing debate about the role of IT and the IT department within the modern enterprise. Many business executives believe that IT has become, or soon will become, a utility that delivers a standardized suite of services to all organizations. Others continue to believe that successful IT investments are essential to their competitive advantage. Some theorists have argued that the increasing centralization of IT services is inevitable and efficient. In The Big Switch: Rewiring the World, From Edison to Google, Nicholas Carr argues that IT will become a basic utility like electricity or telephone service. According to Carr, economies of scale made possible by cloud computing and fast networks will allow centralized providers to supply computing power to consumers throughout the economy at decreasing costs (2008). Consequently, most organizations will decide that maintaining an in-house IT infrastructure is too expensive and does not give them a strategic advantage. A recent example of this perspective comes from an internal document from California State University’s (CSU) chancellor’s office (CO) titled, “Cyberinfrastructure Strategy,” which exemplifies this “utility” view of IT. The CO’s strategy seeks to reduce costs by greatly lessening the number of independent data centers within CSU and centralizing control of networks across the system (2012). However, other business experts argue that there needs to be greater integration between IT and the core business functions of an organization to encourage innovation. IT consultant Susan Cramm recommends that companies “move IT out from the IT department” in order to “move from a world where IT is delivered to the business to one where IT is delivered through the business” (2012). Professor Amit Basu and management consultant Chip Jarnagin advocate for tearing down the “metaphorical glass wall” that separates the IT department from the rest of the business. This wall was created by factors such as “mind-set differences between management staff and IT staff, language differences, social influences … and the difficulty of managing rapidly changing technology.” According to Basu and Jarnagin, managers need to have more, not less, control over the IT functions within their organization. Instead of delegating responsibility for IT to external providers, they need to understand how their organization depends on technology so that they can “tap IT’s hidden potential” to improve service and stimulate innovation (2012). At first glance, these two approaches to managing IT seem to be contradictory. The utility view tells managers that their primary IT objective is to reduce costs by taking advantage of efficient external providers, while the “integration” view tells managers to invest more time and energy in IT to exploit IT for strategic advantage. Harvard Business School professor Andrew McAfee also argues for a merger of the utility and the core service view. McAfee notes how historians and economists view IT as just another in a long line of “general purpose technologies (GPTs)” that emerged in the 20th century. Nevertheless, when these GPTs are understood, used, and integrated, “organizational complements” are created. These organizational complements lead to “better skilled workers, higher levels of teamwork, redesigned processes, and new decision rights.” And yet, to manifest these organizational complements, McAfee believes executives must understand and embrace their three roles in managing IT: 1) assisting in the selection of technologies, 2) nurturing their adoption, and 3) ensuring their exploitation (2006). Function IT allows for the accomplishment of discreet tasks, although its use is not mandated in the workplace. Productivity software (such as Word) or creativity software (such as Adobe Photoshop) fall into this category. Network IT facilitates communication, collaboration, and sharing. The main examples of this type of technology are email, instant messaging, or shared network drives. Enterprise IT is the most all-encompassing form of IT. Since Enterprise IT use is mandated by the institution, it forces changes to workflows and processes. Enterprise IT “imposes complements throughout the organization,” “defines tasks and sequences,” and “mandates data formats.” Examples of Enterprise IT include customer relationship management software, common management systems (e.g., Oracle’s PeopleSoft), or ILSs (e.g., Innovative’s Millennium). 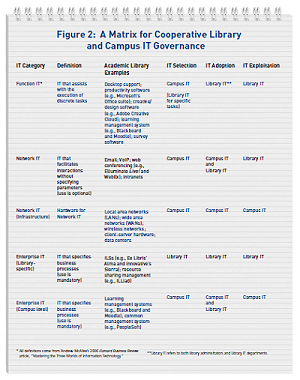 We took McAfee’s three roles for administrators and combined them with his three main IT categories to establish an IT governance matrix (see Figure 2) to identify recommended areas of responsibility for Library IT and Campus IT. Such a matrix should serve as a starting place in facilitating understanding, cooperation, and dialogue between Library IT and Campus IT. The key question for library administrators is, “What do we need IT to do for us?” The matrix in Figure 2 offers one model for governance, but administrators will find technologies to be constantly evolving and cost-cutting efforts on campus to be ever-present. Campus IT may not be a reliable provider of utility services, so the library will have to continue to provide them in order to function effectively. A library’s resources may be so limited that it lacks the capacity for innovative change and may need to outsource all or most of its IT functions to maintain a minimal level of service. This paper does not address how much cooperation and collaboration among libraries is optimal for delivering IT services. This is especially true if an academic library finds itself in a consortium. Centralized Library IT skills in a consortium may greatly assist and augment IT capacity available in individual libraries. The recommendations on the next page offer more detail to library administrators regarding what IT is considered utility (and therefore able to be outsourced) and what IT is a core service (and should be managed by Library IT). This IT governance matrix model and these recommendations provide a starting point for academic library administrators to begin to address the IT needs in their local environment. Ultimately, as technology evolves and the role of IT management along with it, library administrators will find their role increasingly focused on the adoption and exploitation of IT to enhance services. Nevertheless, it is important that library administrators constantly update their understanding of what IT services fall into the “utility” versus “core” designations in order to communicate effectively with Campus IT and other external providers to provide greater efficiencies and superior service to end users. Basu, A. and Jarnagin, C. (March 10, 2008). “How to Tap IT’s Hidden Potential.” The Wall Street Journal. Retrieved from online. wsj.com/article/SB120467900166211989.html. California State University. (Jan. 23, 2012). “Cyberinfrastructure Strategy.” Version: Final. Carr, N. G. (2008). The Big Switch: Rewiring the World, From Edison to Google. New York: W.W. Norton & Co.
Cramm, S. (April 25, 2011). “Put IT Where It Belongs.” The Wall Street Journal. Retrieved from online. wsj.com/article/SB10001424052748704587004576240674197464408.html. McAfee, A. (2006). “Mastering the Three Worlds of Information Technology.” Harvard Business Review, 84(11), 141–149. Rick Robison (rrobison@dvc.edu) is dean of library, educational technology, and learning support at Diablo Valley College in Pleasant Hill, Calif.
John Wenzler (john.wenzler@csueastbay.edu) is dean of the library at California State University–East Bay in Hayward, Calif.
Joe J. Marquez (jmarquez@reed.edu) is web services librarian at Reed College in Portland, Ore.